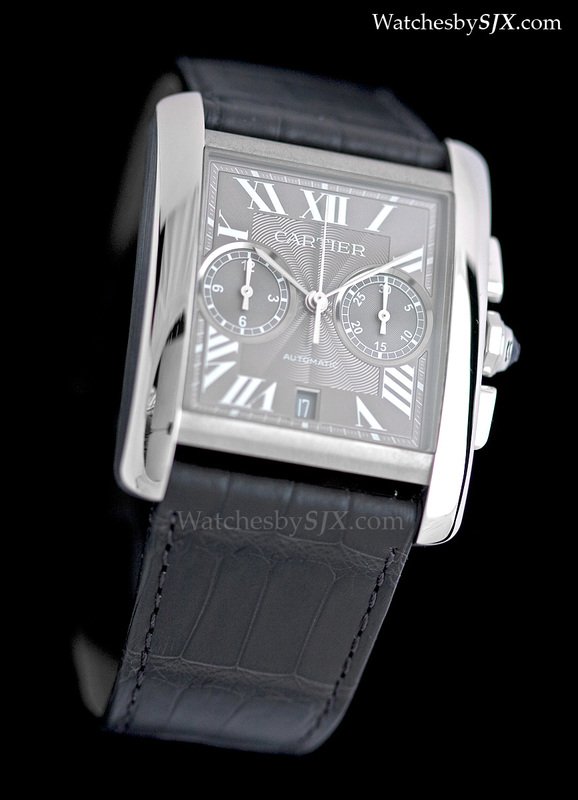 Last year Cartier unveiled the Tank MC, a new version of its classic Tank wristwatch. 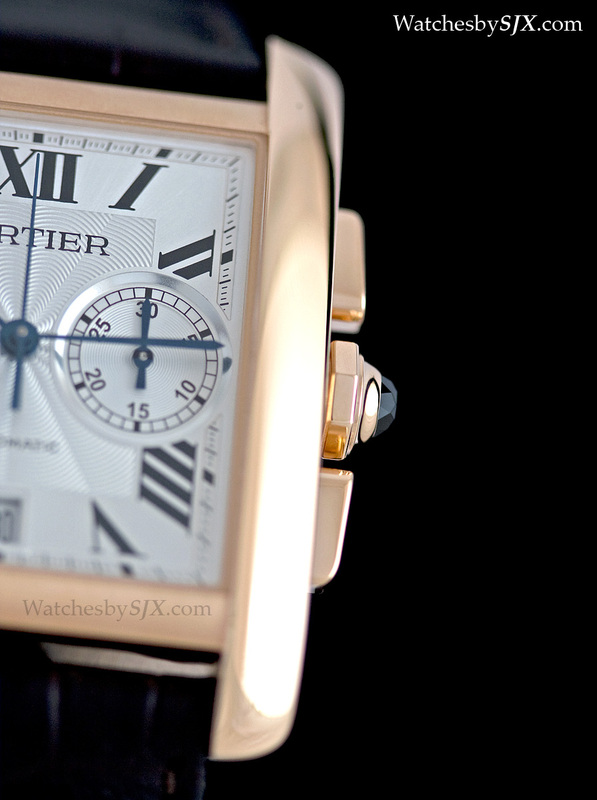 Wider and heftier than earlier Tank models, the Tank MC was designed expressly for men. It joined the long line of Tank models which have helped give the Tank its extraordinary longevity. Now the Tank MC Chronograph joins the collection. Equipped with the in-house 1904-CH MC movement first used in the Calibre de Cartier Chronograph, the new Tank MC Chronograph becomes the new, entry-level chronograph with an in-house movement. The case is the typical Tank form, with polished brancards on each side, and a brushed finish in between the lugs and also on the side of the case. A blue sapphire cabochon tops the crown. Whereas most Tank watches in the past were formal or feminine, the Tank MC Chronograph measures 34.3 mm wide and 43.9 mm long, giving it a noticeable presence on the wrist. 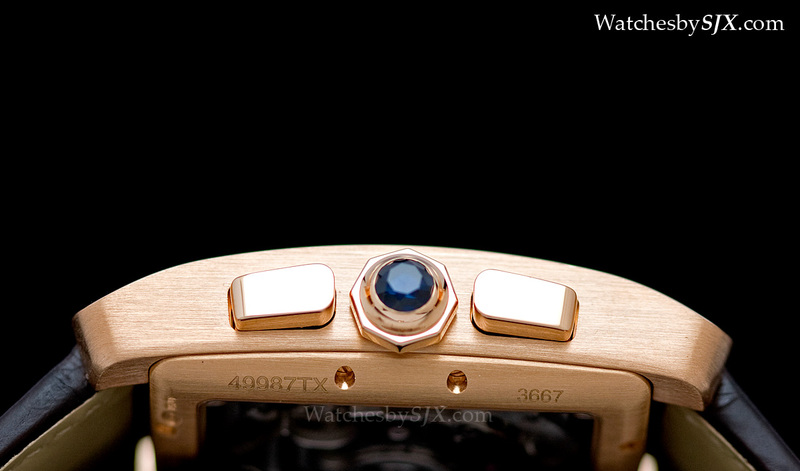 But it is only 11.7 mm, so its proportions remain elegant. 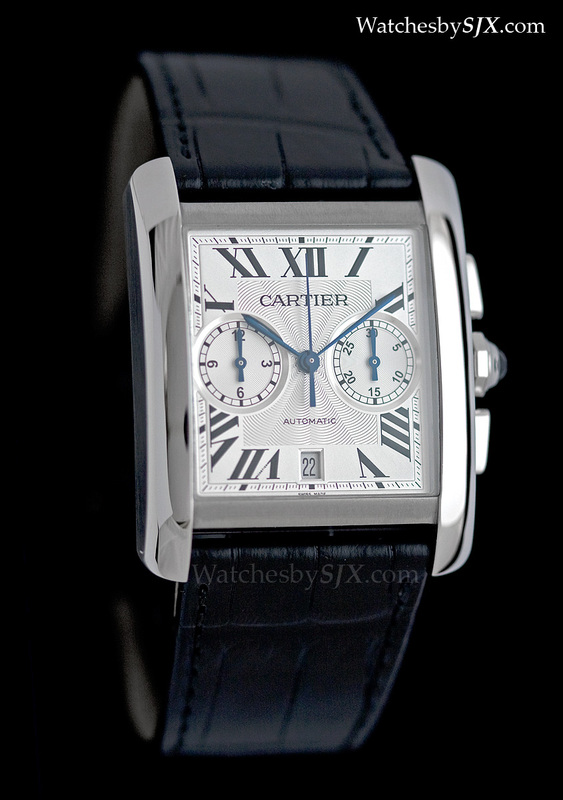 The dial is the classic Cartier style – guilloche with Roman numerals and blued steel hands – with sunken registers for the chronograph. 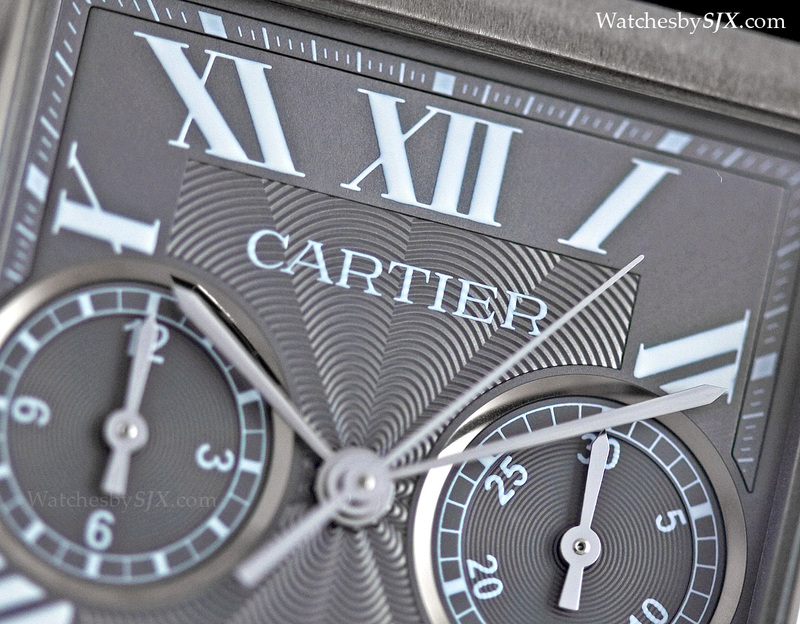 Though the guilloche is likely stamped (instead of being engraved), the dial overall is attractive and well made. A date window, practical but often badly placed on watch dials, sits at six o’clock which is acceptable though not beautiful. Above it, however, is the unnecessary text “automatic”. 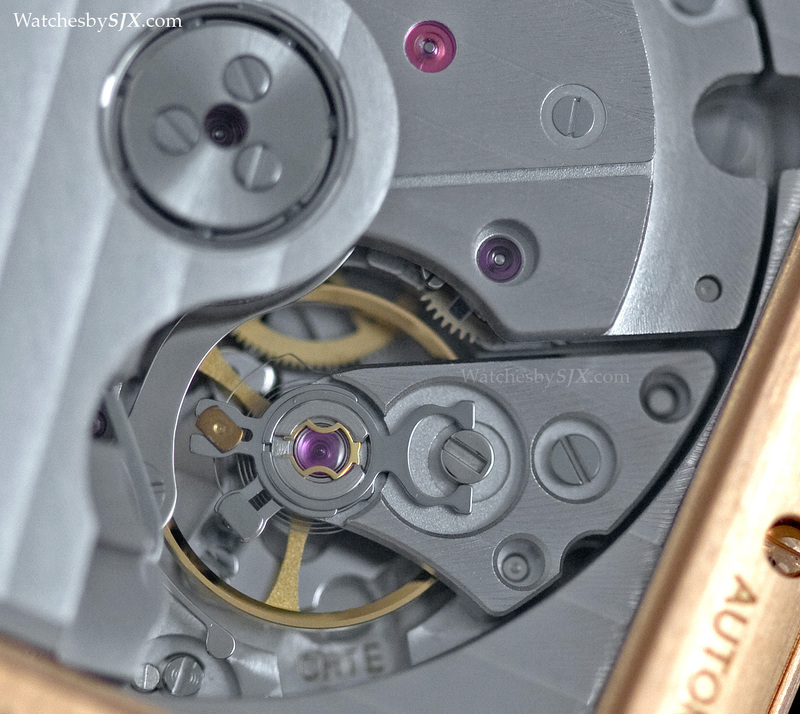 Visible through the display back is the 1904-CH MC movement. 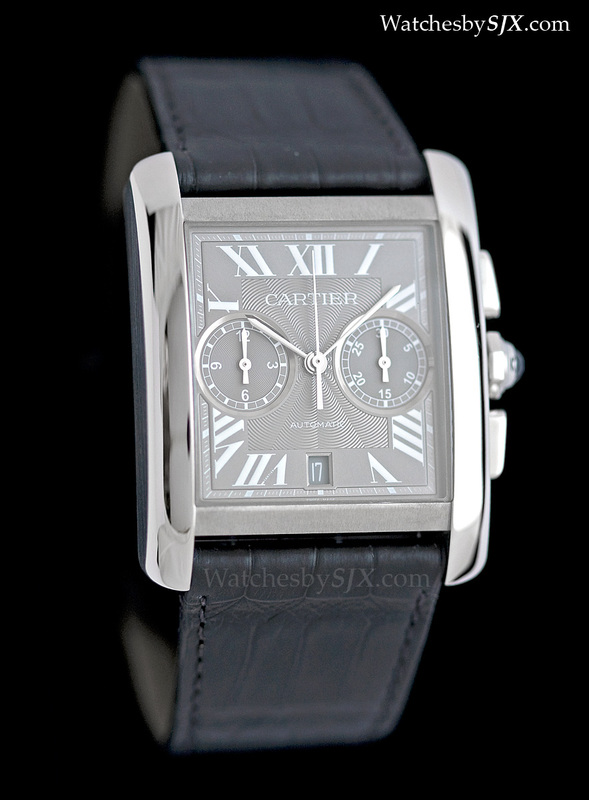 Based on the workhorse 1904 MC calibre, the movement is made in-house by Cartier – the “MC” in Tank MC stands for “Manufacture Cartier”. 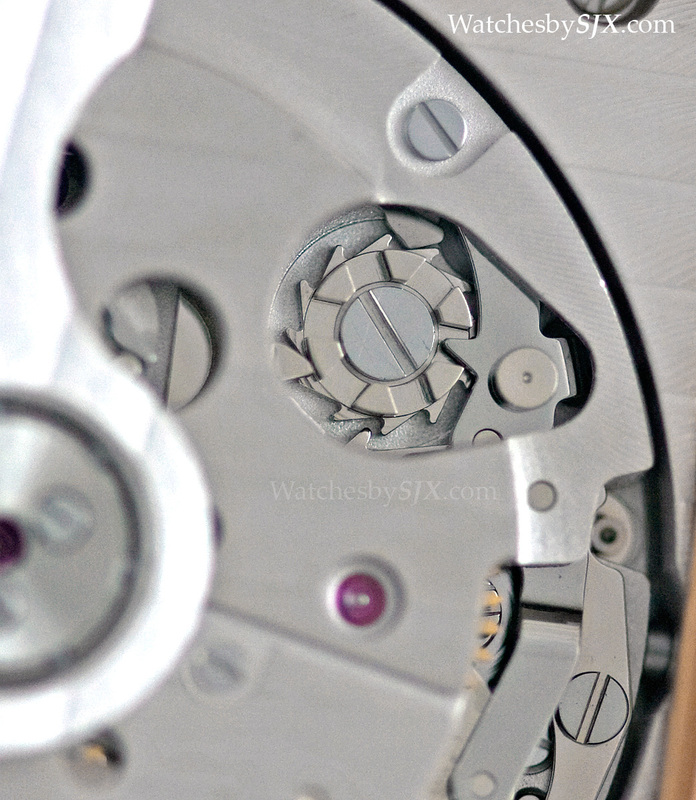 It has all the helpful features of a modern chronograph: a column wheel, vertical clutch and a one-piece reset hammer. 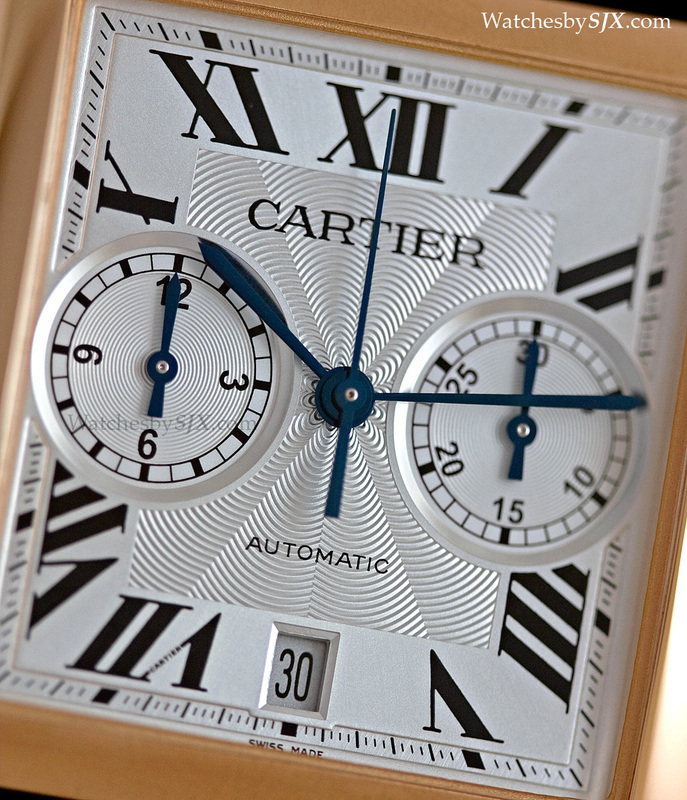 Additionally it features the simple but highly effective magic lever winding mechanism, originally invented by Seiko in the sixties and now a favourite of Carole Forestier. The 1904-CH MC has a 48 hour power reserve, adequate but less than usual amongst contemporary movements, where 60 to 70 hours is common. The finish is par for the course in this price segment, meaning it is sufficiently decorated with Geneve stripes and so on, but not particularly striking. A less monochrome finish would make it more attractive. Though the movement has a C-shaped regulator index, the regulator is still the basic Etachron system, which is reliable and easy to use but unsophisticated and unattractive. 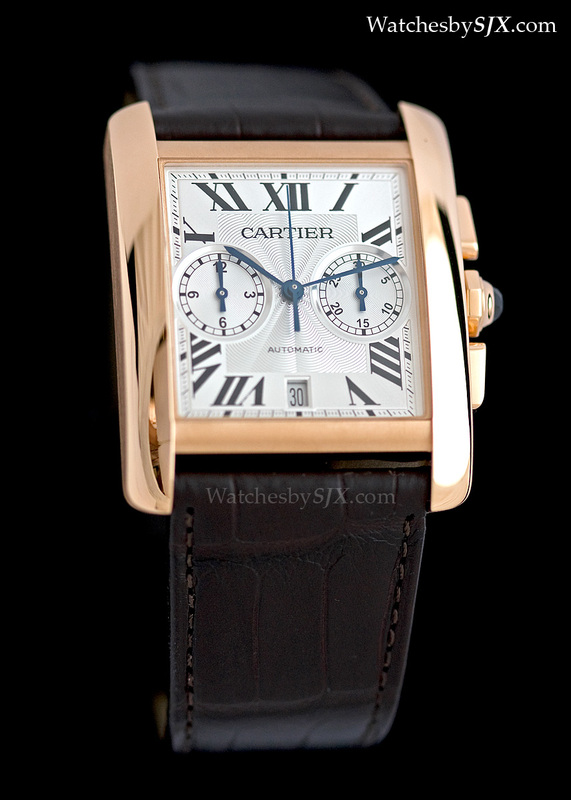 As is usually the case, the Tank MC Chronograph is available in rose gold and steel. 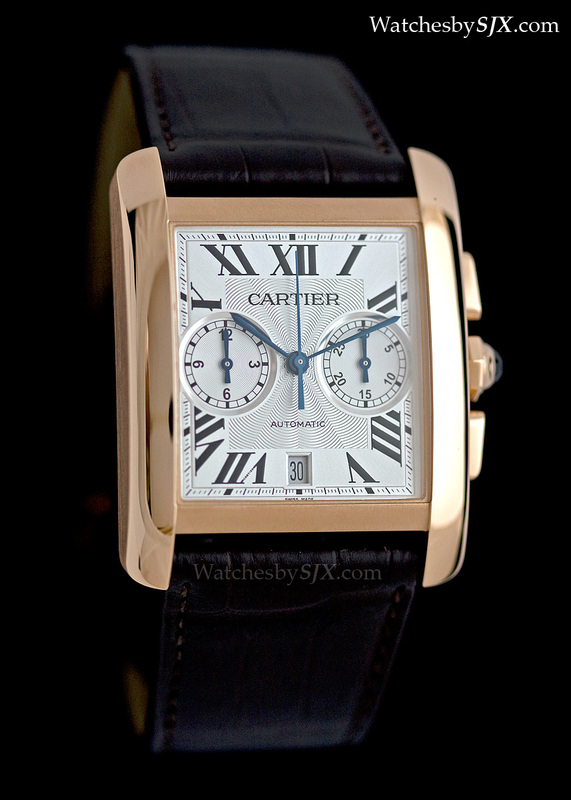 The gold version with its silvered dial has the most traditional Cartier aesthetic. 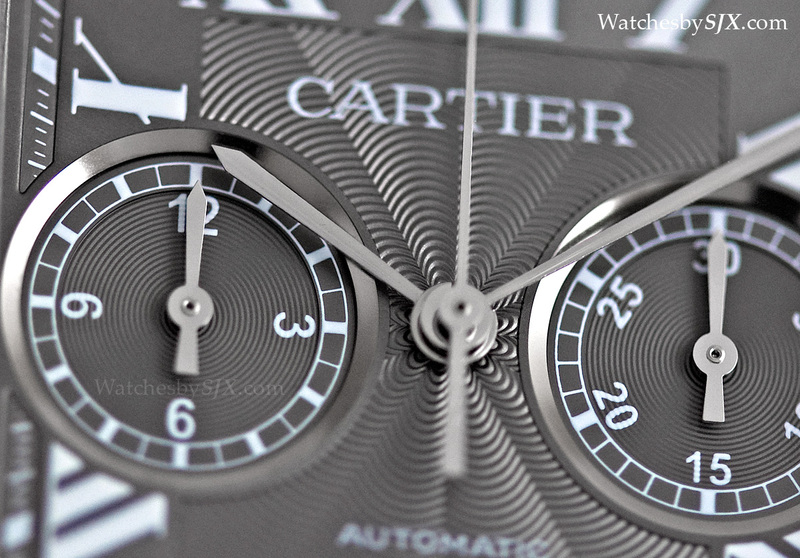 The steel version is available with a silver or grey dial. 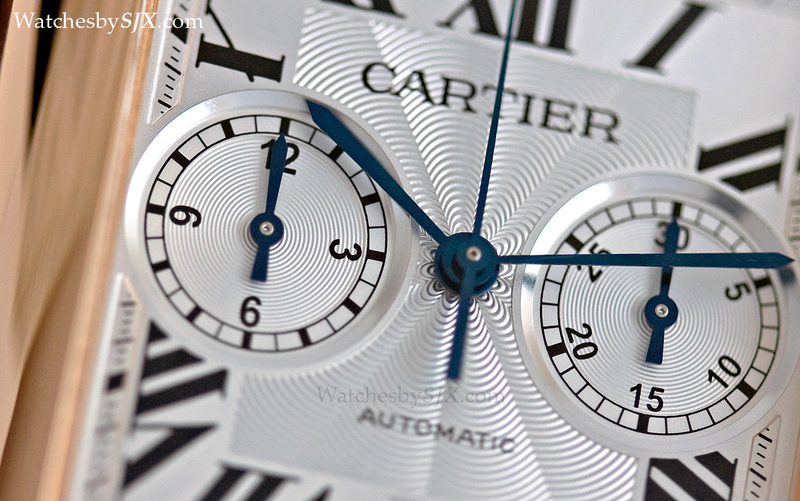 The grey is uncommon and typically found on white gold watches. 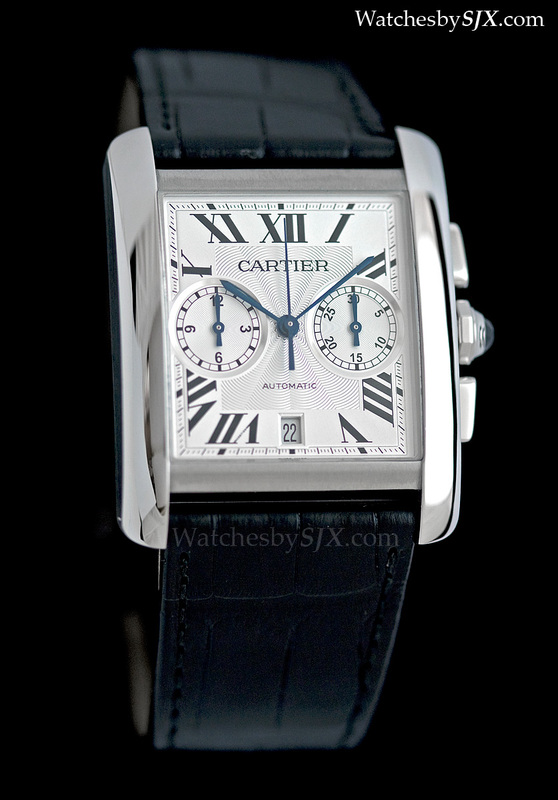 Price-wise the Tank MC Chronograph is accessible in steel, with an estimated retail of €6,950 (~US$9660) before taxes. 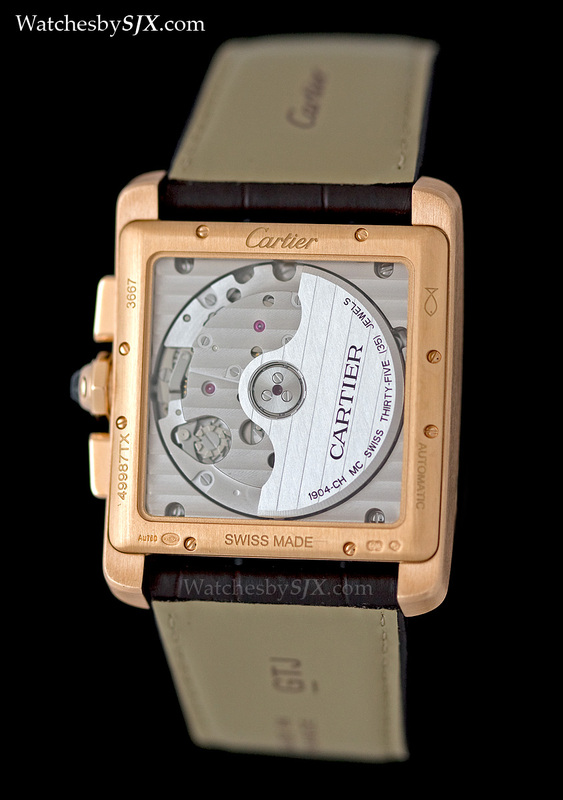 The gold model will sell for €17,400 (US$24,200).